. You Enter Any Phase Number for the Week In The Phase Column, and the Calendar Pops in the Correct Workouts. In the Phase Column, Just Type in 1 For FOUNDATION , 2 For STRENGTH , 3 For PERFORMANCE , or R For RECOVERY WEEK . 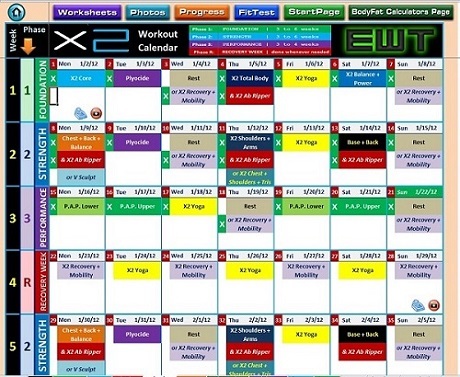 ** The Calendar Will Automatically Pop In the Correct Workouts For You! -- Enter 1, 2, 3 & R In The Phase Column For the 1st 4 Weeks, and Get In a Matter of Seconds. ** Need 2 Extra Weeks? ** Our Worksheets Give You The Option To Just Click The 2 Xtra Weeks Button the Worksheet, and Bam, You Have 2 Extra Weeks, If You Need Them. We Have The 2 Bonus & Optional Worksheets Included As Well. Market List Tool Spreadsheet to make it easy to Filter and Shop for Needed Items. Market List Before Food Selection, and Filtering. P90X2 ® is a registered trademark of Product Partners, LLC LTD LIAB CO CALIFORNIA. We are not affiliated with Product Partners, Beachbody ®, Beachbody.com ®, or Tony Horton. No Product Partners, Beachbody ®, Beachbody.com ®, or Tony Horton trademarks, or logos, appear anywhere in the spreadsheets. No copyrighted materials of Product Partners, Beachbody ®, Beachbody.com ®, or Tony Horton are included in any of the downloads. This Excel Workout Tool is a third-party tool and is not officially written by, endorsed by, or supported by Product Partners, Beachbody ®, Beachbody.com ®, or Tony Horton. This Excel Workout Tool was created to help you get the most out of your workouts with the above mentioned program.